Actors Jr. NTR and Allu Arjun are the popular and most loved celebs down south. The actors who work predominantly in the Telugu industry, have huge fan followers across the globe. Be it for the films or any other act, the information related to these Tollywood stars are noted by the fans. 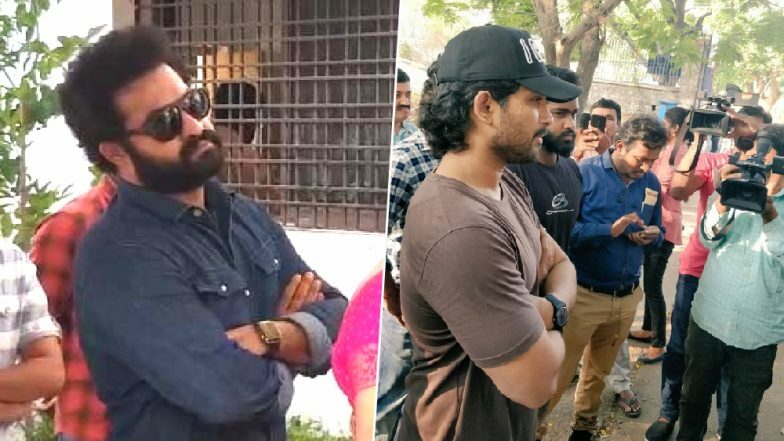 Videos and pictures of Jr. NTR and Allu Arjun has hit the internet in which they were seen standing in queue to cast vote. Yes, two actors have exercised their voting right in Hyderabad. The polling in Telangana for Lok Sabha Elections 2019 started at 7am and these stars were spotted standing in queue. Catch the Live Updates of the Lok Sabha Elections 2019 here. Jr. NTR was seen along with his family at the polling booths. He also shared a picture on his Instagram handle and requested his followers to go out and cast their vote. Even Allu Arjun after casting his vote posted, “Today is that 1 day which will decide how the next 1825 days should be. Pls cast your vote.” Amala Akkinei after casting her vote stated in her tweet, “Voted !! Thank you Hyderabad, nice arrangements , no crowd at 7.30 am , no stress . I love India”. Take a look at the pictures and videos that are doing rounds of the internet. How To Find Your Polling Booth On Mobile Phone, Computer And Through SMS; Voters' Queries Answered For Lok Sabha Elections 2019. In fact even R. Madhavan has said, “Vote Kar.. This is you COUNTRY.. you owe it to yourself .. your Next generation and this Nation.. THINK Hard and long and FINALLY HAVE YOUR SAY. YOU KNOW WHAT HAS TO BE DONE. So go do it . Do not think the others will do it for you. Many A worthy battle has been lost to complacency.” These stars have urged their fans and followers to step out and cast their votes. Stay tuned for further updates on the 2019 Lok Sabha Elections.